This just in from our first guest blogger, Vicki Marshall. Vicki and her business partner, Ron Lawrence, collaborated with Tim on numerous publishing and software projects over the years. It was back in the daze of Nancy Reagan’s “Just Say No” campaign – and the media coverage was all pervasive. Ever since I was a kid, I played around with words. And, while watching TV one night, I scribbled down “Just Say KNOW.” I had a private giggle and “forgot” about it. A few days later, Ron and I were at Timothy’s, returning the first batch of cataloged archive boxes. As we walked in, Tim handed me something he’d cut out from a magazine. This image of Timothy and me was a Polaroid taken by Ron Lawrence in our living room. 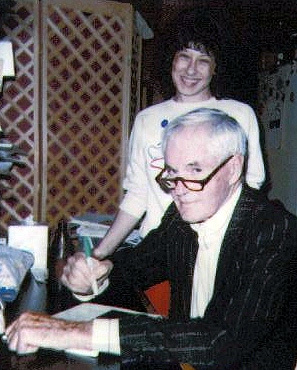 Timothy was signing copies of "Timothy Leary's Greatest Hits, Vol. I" - in 1989. My heart started thumping wildly. As a matter of fact, I DID have an idea for a bumper sticker. He couldn’t have known. I hadn’t mentioned it to anyone. Not even to Ron. “There’s something I gotta do.” I was bubbling over with excitement. 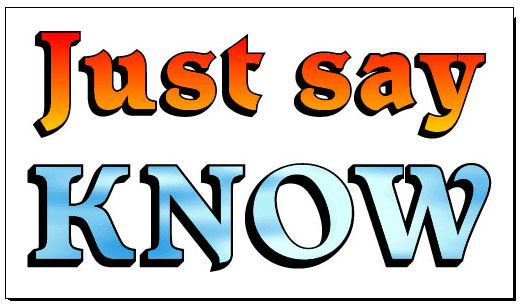 So we went home and, on our Apple ImageWriter printer, I designed and printed a sample bumper sticker that read: Just Say KNOW. Tim rejoined us on the floor and returned to the stack. The room seemed to go deathly quiet as he picked up the make-shift bumper sticker. His eyes widened. Then he started to laugh. 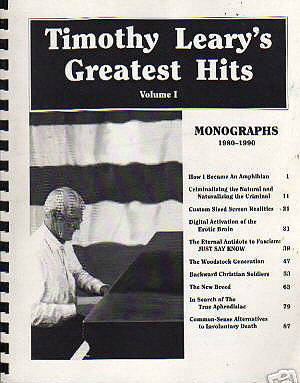 The Cover of "Timothy Leary's Greatest Hits, Vol. I - There's a story behind the cover of "The Hits" also, but that will have to wait till the next post. So we flew home and printed a 16-foot banner on continuous feed computer paper. Then drove back to Tim’s and left it on his door-step. That summer, Timothy did a series of workshops at a restaurant on the Sunset Strip called Carlos and Charlie’s. On opening night, a guy showed up with boxes of Just Say Know merchandise – buttons, bumper stickers, T-shirts. The guy seemed to have a permanent scowl on his face and his demeanor was such that nobody wanted to buy anything from him. So the following week after Timothy’s performance, this very gruff guy came up to me and said, “Sign here” and left me with several beat up boxes – and a whole lot of KNOW ware. This entry was written by lisa, posted on February 5, 2009 at 4:29 pm, filed under Guest Bloggers, History and tagged collaborators, KnoWare, publicity campaigns, ron lawrence, vicki marshall. Bookmark the permalink. Follow any comments here with the RSS feed for this post. Post a comment or leave a trackback: Trackback URL.